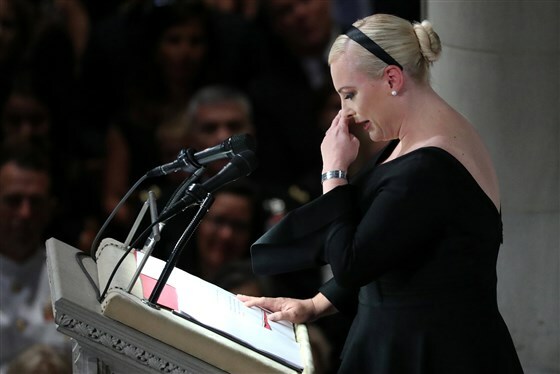 Meghan McCain delivered a fierce and emotional tribute to her late father, Sen. John McCain, in her eulogy at his memorial service, which also served as a powerful admonishment of the president and his political style. Meghan McCain didn’t name President Donald Trump as she spoke at the Washington National Cathedral on Saturday, but the target of her message was clear. “The America of John McCain is generous and welcoming and bold,” Meghan McCain said. “She is resourceful and confident and secure. She meets her responsibilities. She speaks quietly because she is strong. America does not boast because she has no need to. Trump did not attend the service, having been asked to stay away from all events during McCain’s five-day, cross-country procession. However, Ivanka Trump, the president’s daughter, and her husband, Jared Kushner, were present for Meghan McCain’s remarks. John McCain was a veteran of the Vietnam War and spent five and a half years as a prisoner of war after his plane was shot down in 1967. On Saturday, the procession leading to the cathedral stopped at the Vietnam Veterans Memorial where his wife, Cindy McCain, laid a ceremonial wreath. Trump received five deferments from the Vietnam draft for bone spurs in his heels. McCain criticized Americans “from the highest income level” for that very deferment last year, although he did not name the president in his remarks. Others who spoke at Saturday’s memorial — including former presidents Barack Obama and George W. Bush — also noted the difference between McCain’s work for unity and Trump’s tendency to divide. Former Sen. Joseph Lieberman of Connecticut, a Democrat who was once re-elected as an independent, also spoke of McCain’s patriotism and ability to bring people of all political parties together. “His death seems to have reminded the American people that these values are what makes us a great nation, not the tribal partisanship and personal attack politics that have recently characterized our life,” Lieberman said. McCain died on Aug. 25 at the age of 81. Of course she might be biased. And what were Mr. McCain’s memorable slogans during his failed presidential runs? You sound like an American that don’t care about your fellow compatriots. Every day I am embarrassed that America chose you to be our president. 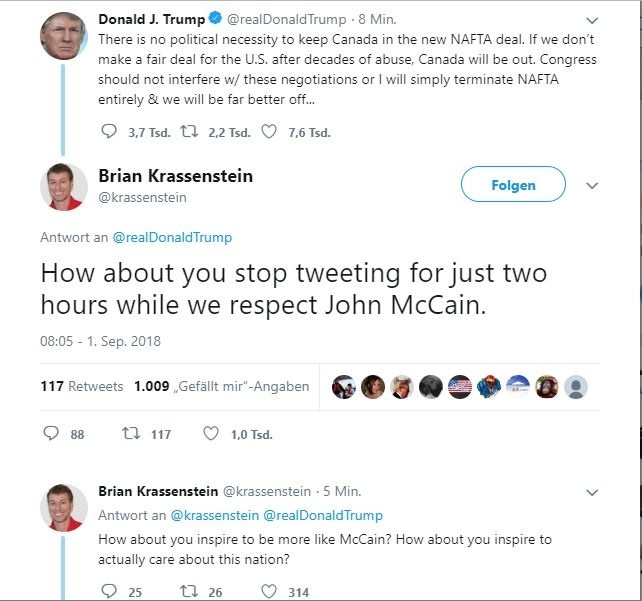 You are a disgrace to the office. We deserve better. One can be civil to another, and even friendly, regardless of political differences. The two couldn’t seem more opposite. Obama’s husband, former President Barack Obama, largely ran against the policies of Bush – including the disastrous Iraq War – when campaigning for president in 2008.